Today – through July 15. Julius (Tkid170) Cavero was raised in the South Bronx. At that time the streets of the south Bronx where a dangerous place for a young boy, the streets here full of Gangs and drugs and there was not a young boy like Julius could do, but to be a part of his environment. Julius started to scribble graffiti in a neighborhood park. He was approached by neighborhood gang and told that if he wanted to write graffiti he would have to join the gang or they would hurt him every time they saw him. So Julius had no choice but to be part of that gang. He started writing (king 13) and the name of the gang (Bronx Enchanters) everywhere. He continued the gang life till he was shot 3 times in a park by another gang when he refused to take off his Gang jacket. While Julius was in the hospital he realized that none of his friends from the gang came to visit him. Only his mother and his brother would come and see him. He decided to never again be part of any gang and he changed his name from king13 to T.kid170. When T.kid left the hospital he went straight to the train yards and leaves the gang life behind. Graffiti became his life. He dedicated to turn those steel monsters in to rolling works of art that brightened the darkest tunnels of the New York City subway system. Tkid was renowned for his letter style and use of colors. 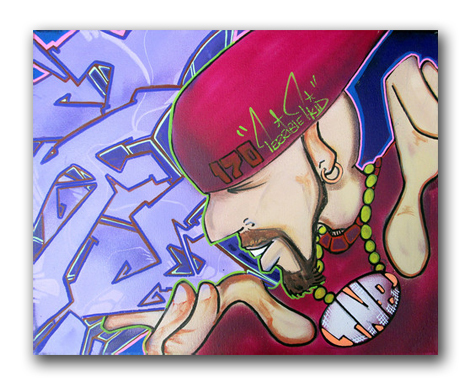 He was one of the first Graffiti artist to start painting Graffiti on canvas when he was invited to be a part of the Sam Esses project in 1980, some of the other artist that where a part of this project where Futura2000, Zephyr, Haze, Bilrock to name a few. 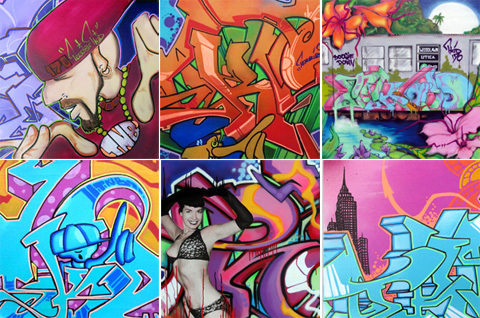 In 1982 T.kid left the subways and painting graffiti illegally so he could exhibit his art in Galleries all over NYC. His first exhibit was at the 1199 gallery. This was the working people`s gallery and all his work was sold. He later exhibited in the Fashion Moda gallery. and the Fun gallery. Ok Harris, P.S1, Sidney Janice Gallery and countless small galleries in the SoHo area of lower Manhattan. Eventually T.kid would travel to Europe painting his first mural for T.D.K cassettes on a bill board in Vauxhall crossing in the heart of London England. Later on Exhibiting in Galleries in Berlin Germany, Paris France, Stockholm Sweden, Madrid Spain, Johannesburg South Africa and Countless other countries. Most recently T.kid has been selling his art In Auction houses such as Phillip Depury & co and Guernsey’s to name a few. He has sold work to countless collectors such as Marc Ecko a giant in the clothes manufacturing business and Gunter Sachs world renowned philanthropist. T.Kid`s auto biography of growing up in the South Bronx (The Nasty Terrible T.kid170) was sold out in its first and second publishing. He continues to travel the world influencing a new generation of artist spreading his message of hope. That no matter where you come from you can succeed if you only try.